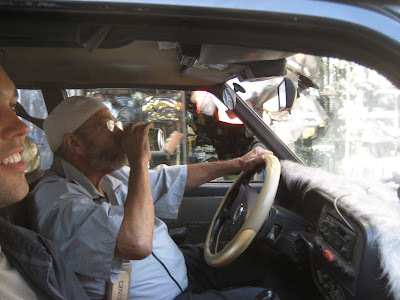 Horns here in Cairo usually come with four wheels, a steering wheel and an operator. The operator's primary purpose is to honk said horn in an effort to anger and confound the pedestrians of the city. My operator was doing a stellar job. In five minutes he had chalked up over 30 honks. At this rate we might finally break the 100 honk barrier on this cab ride. He was of course good at honking at cars, mopeds and pedestrians, but in addition he was also excellent at performing horn malfunction tests (honking the horn for seemingly no reason to see if it still works). Yup, still works. It had taken a while to communicate my destination. I was trying to get to the Northern Cemetary to check out where squatters have created a whole town within the tombs. I started the game of charades by trying to act out death. Laying down in the taxi cab seat, I closed my eyes and crossed my arms over my chest. Soon enough we were on our way. We finally got to the cemetary. Only 86 honks. I hung my head low, kicking myself for not knowing the Arabic phrase for "keep circling the block please". I didn't know whether to focus on counting his honks or his burps from chugging the can of soda. Sensory overload.